1. If the crabs are still alive, put them in the freezer for 15- 20 minutes to immobilize them. Cut crabs into half lengthwise with a heavy cleaver. Remove the back and spongy gray part. Separate claws and smash them with a mallet, keeping the legs attached. 2. To make the Chilli Ginger Sauce, blend all the ingredients in a mortar or blender. Set aside. 3. Heat the oil in a work over medium heat and stir-fry the shallots, garlic, ginger, and chili until fragrant, about 3 minutes. Add the Chilli Ginger Sauce, chicken stock, black bean paste, chili sauce, tomato sauce, sugar, rice wine, salt and pepper, and bring to boil. Then reduce the heat and simmer, for 2 minutes. 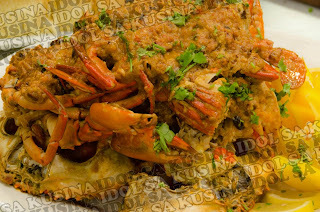 Add the crabs and five kinds of chorizo, simmer uncovered, tossing several times until cooked, about 10 minutes. 4. Add corn starch mixture and stir the sauce until it thickens. Add the eggs and stir gently until they set, then transfer everything to a large serving dishes. Garnish with fresh coriander leaves and spring onions, and serve with soft dinner roll on the side.